Within the next decade, it may be possible for a Veteran to use a simple nasal spray to reduce pain if an ambitious research study at the Southeast Louisiana Veterans Health Care System completes early stage laboratory investigation and moves to human clinical trials. 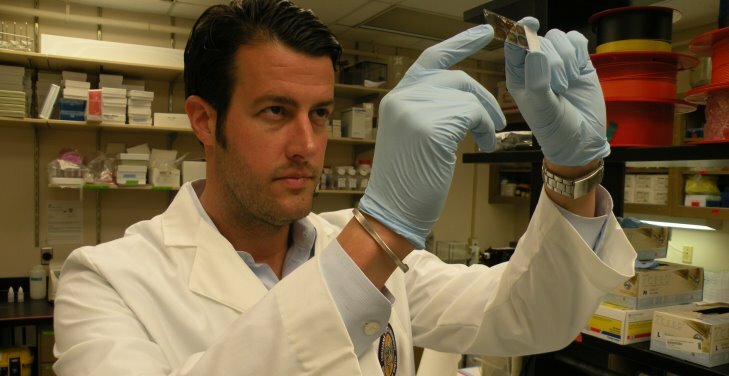 Dr. Nicholas Gilpin, who recently was awarded a research grant from VA, is working to identify the neurobiological mechanisms in underlying heightened pain states in the context of alcohol dependence and stress disorders. Veterans are more frequently diagnosed with post-traumatic stress disorder (PTSD) and alcohol use disorder than the general population. Furthermore, those with PTSD often self-medicate with alcohol in amounts that worsen their health – leading to a huge health and financial burden. Gilpin and his staff are working to develop therapeutic strategies that reduce pain in Veterans living with PTSD and/or alcohol use disorder. Gilpin’s grant will support work to examine the contribution of brain melanocortin-4 (MC4) receptor signaling to pain processing in those living with alcohol dependence or traumatic stress disorders. Gilpin completed his undergraduate training in psychology at the University of Texas, and his Ph.D. in psychobiology at Indiana University-Purdue University in Indianapolis. He went on to complete a post-doctoral fellowship in the labs of Drs. George Koob and Marisa Roberto at The Scripps Research Institute in La Jolla, California, where he used behavioral pharmacology and electrophysiology techniques to explore neural and behavioral dysregulation associated with alcohol dependence. The Merit Review research grant is one of VA’s Office of Research and Development programs, which for the past 90 years has supported the groundbreaking achievements of VA investigators that are improving the lives of Veterans through health care discovery and innovation. Gilpin’s project was one of 111 selected (out of 466 reviewed) for funding last year. “My hope is that our lab can provide evidence for MC4 receptor signaling as a viable target to reduce pain in Veterans living with PTSD and/or addiction, and that this work will lead to clinical trials, and can eventually be used to improve the lives of Veterans living with these debilitating conditions,” he said. Earlier this year, Gilpin was awarded the Presidential Early Career Awards for Scientists and Engineers, the highest honor presented by the United States government upon science and engineering professionals in the early stages of their independent research careers. Gilpin is the only Louisiana recipient of the award. About the author: Jeff Nowakowski is a public affairs specialist at the Southeast Louisiana Veterans Health Care System. I believe that if you really look at this, it will cover a broad range of problems, including Parkinson’s disease, and others. We can only hope for the best. One pill will solve the problem with being traumatized by Combat!! !Give this pill to the POGS faking PTSD and never ever served in ground Combat.I met a Sailor at the VA in Savannah Ga telling me he has PTSD…I asked him if he was in Combat,he said no but the stress on being on ship with Marines like me caused his PTSD..Really!!!!! !Faker for compensation!!!!! I am a veteran who retired working in the Denver VA’s ICU and I always had an issue with non-combat vet’s saying they had PTSD from their service, on a ship, in peace time. Drove me crazy to listen to their crud. Sounds very promising and to support Paula’s comment we need help as soon as we can get it. My question is while many meds have been prescribed there is still the issue of the ADHA individuals. Most medications/cocktails for PTSD have the complete opposite results as one would normanlly experience. Can you tell me if ADHA symptoms have been considered in this study? I hope this help comes soon. My son does not have another decade od beurocratic red tape. He needs help now. He is not alne in hus struggle. 23 Veterans a day commit suicide from the ravages of PTSD. While this is a very hopeful break through. Ehat are you doing for them today?